https://archive.org/download/Shortvowelsipa/shortvowelipa.mp3Knowing how the English vowel system works, with Long-vowels and Short-vowels, can help train your brain to work with English in a way that is similar to how native-speakers process the language. It can help you be better with spelling, and with being more confident in figuring out how to say new words. 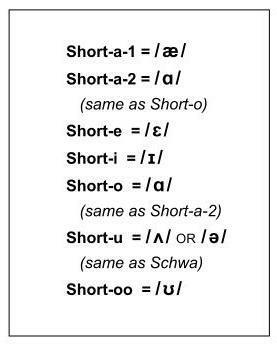 At the same time, it is also good to be aware of the IPA (International Phonetic Alphabet) symbols for the vowels. Obviously this is very helpful if you are already familiar with the IPA symbols. But even if you have never seen these symbols before, taking a look at them can give some helpful insights for English pronunciation.